On his first state visit to China, U.S. President Donald Trump received a “royal” welcome. He was hosted at Beijing’s spectacular Forbidden City, the bastion from where dynasties of Chinese emperors ruled for almost 600 years, and offered tea in the complex’s Hall of Embodied Treasures. An official photograph of the visit shows the former reality show star surrounded by a phalanx of Peking Opera performers in glittering, exotic costumes at the Belvedere of Pleasant Sounds, the palace theater once meant only for the royal family and their entourage. 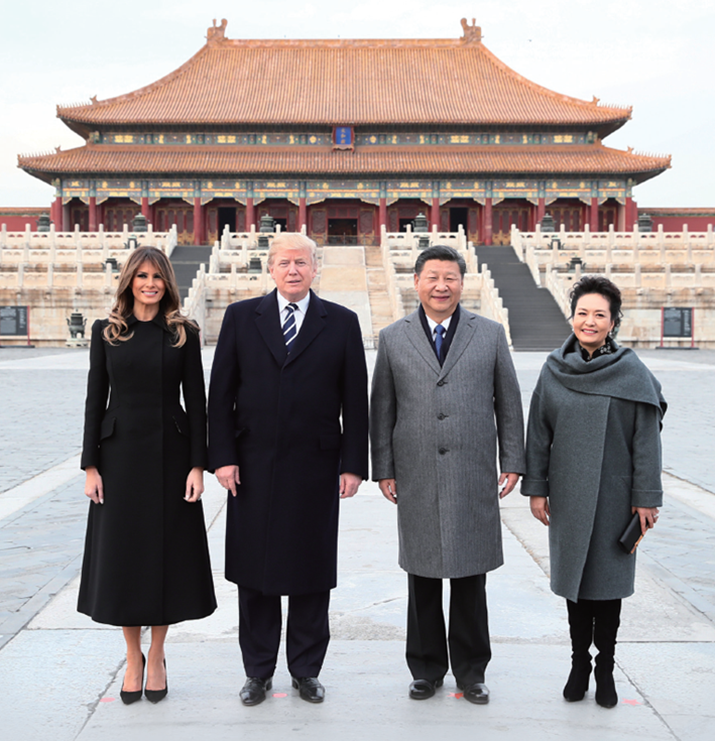 If the Mar-a-Lago meeting in April, when Trump hosted visiting Chinese President Xi Jinping at his beach resort, saw the breaking of the ice between the two governments after Trump’s earlier anti-Chinese election rhetoric, then the diplomatic t’te-‡-t’te at the Forbidden City, also known as the Palace Museum, was perhaps an overwhelming avalanche. Prior to the visit, Chinese Ambassador to the United States Cui Tiankai revealed that Trump’s China trip would be a “state visit-plus.” During the visit, all the arrangements were highlighted by treating the U.S. guests to doses of Chinese culture before and after the serious stuff, including a military guard of honor and state banquet. However, this is not entertainment alone. The firsthand taste of Chinese history and culture may guide the U.S. president to a better understanding of China. As William Jones, Executive Intelligence Review magazine’s Washington bureau chief, told Xinhua News Agency, “While social and cultural dialogue often doesn’t get as much attention as economic or security dialogues do, it may prove to be the most important dialogue of all in the long run. While one visit is not likely to resolve all the existing problems between the two countries, China’s special and well-thought-out arrangements for the Trumps indicate the sincerity of the Chinese hosts to deepen bilateral mutual trust and smooth the way for the further development of bilateral relations. The China visit has seen Trump--facing a difficult situation in his own country, due to both the probe by former FBI director Robert Mueller into allegations of Russian interference in the presidential elections, and the recent election losses for his party--now banking on his personal relationship with Xi. During their talks in Beijing, the two presidents agreed on maintaining the strategic leading role of head-of-state diplomacy in developing bilateral relations. Xi noted that the Sino-U.S. relations are “at a new historic starting point,” and China is willing to work together with the United States to respect each other, seek mutual benefit and reciprocity, focus on cooperation and manage and control differences. Frequent interaction between the presidents has helped to establish their personal friendship, and the Beijing trip adds to that. On the Trumps’ side, there was also a cultural overture. During the Beijing trip, the president played, with grandparental pride, a video clip showing his 6-year-old granddaughter, Arabella Kushner, reciting ancient Chinese poetry and singing Chinese songs. International media also commented on the Arabella phenomenon. “President Donald Trump’s granddaughter, Arabella Kushner, has once again played a bridging role in U.S.-China diplomacy,” Associated Press said. “Trump granddaughter aids U.S.-China diplomacy,” U.S. radio station KURV said. There has been a steady effort since Trump came to power to promote bilateral mutual trust. During the Mar-a-Lago meetings, the two presidents agreed to establish four high-level dialogue mechanisms: on diplomatic and security issues; the economy; social and people-to-people exchanges; and law enforcement and cybersecurity. Each mechanism has already held its first meeting. In the first round of the law enforcement and cybersecurity dialogue, held in Washington, D.C. in October, the two sides reached broad consensus on counterterrorism, counter-narcotics, cybersecurity and immigration issues. Before Trump’s three-day China visit started on Nov. 8, there was speculation that the agenda would include trade talks, especially in view of the perceived imbalance in Sino-U.S. trade, and discussions on the Korean Peninsula issue, especially after Trump recently antagonized the leadership of the Democratic People’s Republic of Korea (DPRK) with his address at the United Nations General Assembly. The U.S. president did not disappoint on discussing trade. However, though he complained that China-U.S. bilateral trade was not very fair to the United States, the tone was mild. He was reported as saying that he didn’t blame China for the deficit, but rather the incompetence of past U.S. administrations. However, the perspective that Sino-U.S. trade is far out of kilter is not an accurate representation. In July, Chinese Vice Finance Minister Zhu Guangyao explained, after the first China-U.S. Comprehensive Economic Dialogue in Washington, D.C., that China is not intentionally pursuing a trade surplus. In fact, China, while enjoying a surplus in the trade of goods, suffers from a deficit in the trade of services. Also, the stated surplus in goods trade unfairly includes products made in China by U.S. companies, which are regarded as Chinese goods in the tally. If calculated through the value-added approach, instead of by the rules of origin in trade, the U.S. trade deficit with China would be only half of its current stated volume, said the U.S.-China Business Council in a January report, which also noted that China-U.S. trade relations have supported roughly 2.6 million jobs in the United States. U.S. export barriers against China are also believed to be one of the major causes of the small scale of U.S. exports. As China steps up its industrial modernization, there is huge market potential for U.S. exports of advanced technologies, key equipment and critical parts. According to an op-ed by the Carnegie Endowment for International Peace last April, if the United States liberalized its export barriers against China, as it has with Brazil and France, the U.S. trade deficit with China would shrink substantially. Heeding these arguments, the China-U.S. Comprehensive Economic Dialogue agreed to address the trade imbalance by increasing U.S. exports to China instead of reducing imports from China. This was also the crux of the 100-day action plan agreed upon by the two presidents at Mar-a-Lago. The first fruit of this new understanding came in June, when beef shipments began arriving in China from the United States after a 13-year ban following the outbreak of mad cow disease in the U.S. The U.S. will also export liquefied natural gas to China, which, following the shale gas boom in the U.S. and China’s quest for green fuel to reduce its environmental pollution, will be a win-win deal. More beneficial trade will soon flow, as Trump’s visit witnessed Chinese and U.S. companies signing trade and investment agreements worth over $250 billion, including China buying U.S. beef, soybeans and pork, as well as mobile phone chipsets from Qualcomm, vehicles and parts from General Motors and Ford and jetliners from Boeing. Xi also said that China is ready to look at other energy and agricultural products from the U.S. The outcome of the other items on the agenda will not be so promptly discernible. But the absence of additional anti-DPRK rhetoric is another sign of Trump’s mellowing in Beijing. Although he said that all responsible nations must join together to stop arming, financing and even trading with Pyongyang, his approach has included considerable dependence on China’s role. The two presidents agreed on the need to implement all United Nations Security Council resolutions on North Korea, which means the U.S. will continue to trod the diplomatic path following the consultations in China, and the war rhetoric has been suspended, at least for now. He added that China and the U.S. are willing to work with various concerned parties to explore ways of realizing lasting peace and stability in Northeast Asia, and that the two nations will continue to maintain communication and cooperation on the issue. With China’s growing role in world affairs, the agenda, not surprisingly, also dealt with other pressing issues, like Afghanistan, radical Islamic terrorism and drug trafficking. While the details of the agreements--and perhaps a few disagreements--will emerge later, what has been seen is the leaders of the two biggest economies in the world speaking with one voice, presenting a united front despite their differences.